The Bannari Amman Institute of Technology was established in 1996 by the Bannari Amman Group, serves as one of the citadels of higher education in the Southern part of India. BIT aids to impart knowledge, teamwork, innovation, entrepreneurship, courage, sacrifice and duty which are innards of a meaningful life. BIT has transformed and ingrained various cutting edge administrative and academic reforms. The Institute caters to the needs of the students and members of faculty in realizing their dreams and aspirations. BIT has been conferred with a number of accolades and recognition from top-notch forums of high eminence. Bannari Amman Institute of Technology, Sathyamangalam offers various graduate courses as well as Post Graduate courses. The Department of Computer Applications was established in the year 1999 to produce world-class software professionals in the emerging areas of Software Technology. To provide professional software training programmes to the students to upgrade their technical knowledge and skill. To provide excellent opportunities through open student-oriented culture for all round development of the students leading to the growth and prosperity of our nation. To motivate faculty members for their continuous upgrading of the skills and knowledge and to evolve a student friendly education system. The diverse developments in computer technology, communication explosion and the Internet are bound to make a marked change in our life in the coming years. These form the basis for "Information Technology" - the technology of the coming decades. The potential of computer technology needs no emphasis. IT comes under the scheme of Modernization and Removal of Obsolescence. To meet the challenges of the Information Revolution, BIT with insight into upcoming trends tries to meet the requirements of this changing global scenario. The IT department of BIT was started in the year 1999. The first batch of 66 Information Technologists graduated in the year 2003. The department boasts of 26 qualified faculty members who are highly skilled. There are more than 500 students regularly being trained in leading edge technologies with a practical orientation. The department also runs a master degree in software engineering. To facilitate students acquiring theoretical knowledge as well as practical skills needed for meeting the challenges in the field of Biotechnology. To achieve excellence not only in teaching – learning processes but also in adopting innovative techniques required to improve product quality in Biotech industries. The Mechanical Engineering Department was started in the year 1996. The department offers four year B. E (Mechanical Engineering), M.E (Engineering Design) and Ph.D programmes in Mechanical Engineering. The department has a team of highly qualified, dedicated and motivated faculty and well equipped laboratories with facilities for UG, PG Programmes and advanced study and research. B.E. and M.E. Courses have been accredited by National Board of Accreditation, AICTE, New Delhi. The Department’s mission is to generate employable mechanical engineering graduates with knowledge, skills and ethics; provide them with the professional and soft skills necessary to lead a successful career and peaceful life and equip them with the confidence necessary to contribute to society by performing in their respective chosen fields of endeavor. The field of Mechanical Engineering encompasses many exciting subjects such as Automobile Engineering, Production Engineering, Computer Aided Design and Manufacturing, Power Plant Engineering, Refrigeration and Air Conditioning, Mechatronics, Automation and Robotics which have been among the fastest growing and most challenging technologies that enable the development of the modern knowledgeable society. The Department has a wide range of teaching and research activities, grouped under ten areas, namely (i) Production (ii) Manufacturing (iii) Design (iv) Thermal Engineering (v) Automation (vi) Mechatronics (vii) Robotics (viii) Composite Materials (ix) Applications of Intelligent Optimization Techniques and (x) Industrial Engineering & Management. The department takes up the task of moulding the young minds to nurture technocrat leadership capabilities for the future techno savvy based society. To achieve excellence in the academic delivery and curriculum planning pertaining to mechanical engineering by adding value based software and hardware addendums to the core subjects. To upgrade and monitor the system of faculty development to achieve greater scales in research by routing the funding agencies through plethora of innovative research proposals. To make the young mechanical engineers blossom into entrepreneurs, scientists, industrialists, academicians and technocrats in equal proportions to have a technological balance. To make the students aware of the impact of Electrical and Electronics Engineering in the global industries scenario and the challenges of Electrical based industries and organizations. To equip the students to prepare themselves to meet the demands of the growing industries and to become exemplary professionals of high standard in the field of Electrical and Electronics Engineering. To mould them as successful entrepreneurs contributing to nation’s economic growth. To offer an educational programme with a plethora of innovative concepts, for creating a host of talented professionals. To foster an open student – oriented culture and perhaps even more important, an understanding of students, their needs, goals and aspirations. To develop exceptional opportunities for study and research and system of industry – institution interaction, through industry – liaison cells, for students to contribute to our nation’s economic growth. To evolve a friendly face of education with emphasis on engineering, technology and research. The Department of Electronics and Communication Engineering which was started in the year 1998 offers a UG Programme (B.E.) in Electronics and Communication Engineering and PG Programmes (M.E.) in Applied Electronics, Communication Systems & VLSI Design. The B.E. Electronics and Communication Engineering Programme and ME Applied Electronics have been accredited by NBA, New Delhi. The department has also been recognised as a centre for carrying out Ph.D./M.S. (By Research) Programme under Anna University. The department has a team of committed faculty members who are not only well qualified but are also backed by rich industrial / research / teaching experience. Mission: To facilitate students acquiring theoretical knowledge as well as practical skills needed for meeting the challenges in the field of Electronics and Communication Engineering. To achive excellence not only in teaching – learning processes but also in adopting innovative techniques required to improve product quality in Electronics and Telecom Industries. The Department of Computer Science & Engineering is a unique center of BIT established in 1996. It offers a 4 year B.E (Computer Science & Engineering) programme and 2 year M.E. (Computer Science & Engineering) programme. It has dedicated and specialized faculty members in different areas of computer Science & Engg., with rich experience in academics, industry and research. The department has well equipped and spacious laboratories with modern computer equipments. The Department of Textile Technology established in 1996, offers 4-year B.Tech. Textile Technology programme, which is accredited by AICTE, New Delhi . The department also offers Ph.D. & M.S. (by Research) programmes. The faculties Members have rich teaching, research and industrial experience. The members of the faculty have published more than 250 papers in leading national and international journals including Refereed, and in various seminars and conferences. The spacious laboratories are well equipped with the state-of-the-art facilities in Yarn Manufacture, Fabric Manufacture, Textile Chemical Processing and Textile Testing. The Department has undertaken five sponsored projects of worth Rs. 65 lakhs from DBT, DST, DRDO and AICTE, New Delhi . The Department library is facilitated with good collection of books and journals with internet connection, besides central library facility. The Department has Patron membership with SDC (UK). To build and nurture a new generation of Technologists who can be the future leaders of textile industry, by providing good quality education. To Empower the Indian textile incorporation through powering the students by importing competence to face the challenges with Holistic knowledge of technical, carrier development, societal and life long learning capabilities. The Indian Apparel Industry is growing at an appreciable rate and is in great need of qualified professional engineers and technologists to transform the industry into an organized sector with an essence for creativity, innovation and new product engineering. To cater to this ever-increasing requirements of the garment industry, a 4-year B.Tech. Textile Technology ( Fashion Technology) programme was started by our Institute in 2004 to develop qualified, skilled and competent technologists to take up ever-demanding challenges of the apparel industry. The curriculum is drawn with thought provoking concepts in the field of garment designing, manufacturing, apparel-fashion designing and merchandising, quality assurance, etc., with greater emphasis on engineering aspects involving basic science, engineering and textile technology concepts. It is accomplished through the dedicated efforts of a team of well highly qualified and learned faculty, experts from apparel industry, and the state-of-the-art laboratories equipped with latest software, hardware, equipment and machinery. The department also provides a practical training both in-house and in industry, so that the graduates confidently enter the industry with latest knowledge of events that happen in the ever-changing world of apparel industry. To build and nurture a new generation of Technologists who can be the future leaders of apparel and fashion industry, by providing good quality education. To set apart very high standards in fashion education by developing student’s creativity and innovation through sustained efforts and extensive training. The Department of Aeronautical Engineering was started in the year 2008. The department offers 4 year undergraduate programme, B.E. in Aeronautical Engineering. The department has a team of highly qualified, dedicated and motivated faculty and well equipped laboratories. An independent Aeronautical Engineering block called Centre for Aero science with a built up area of 72000 sq ft was inaugurated by former President of India, Bharatratna, Dr. A.P.J. Abdul Kalam on July 16th, 2010. This Aero Science Centre houses laboratories, classrooms, faculty rooms, sophisticated Modeling and Simulation lab, Aero science Museum, Seminar hall, conference hall and Department library. 1. Aerodynamics and CFD. 2. Aircraft Structures. 3. Aircraft and Rocket Propulsion. 4. Avionics. 5. High Temperatures materials and composites. 6. Aircraft systems and Instrumentation 7. Airframe and engine maintenance areas. The department prepares the graduates to undertake design, research and maintenance activities to choose their careers in aeronautical and aerospace engineering. Vision: To impart high quality innovate education so as to make the students to take up challenging tasks in aerospace field which is highly multidisciplinary in nature. Mission: The department aims to prepare the young engineers to become globally competent technocrats for success and leadership in the areas of aeronautical and aerospace engineering disciplines through innovative educational programs with practical orientation. 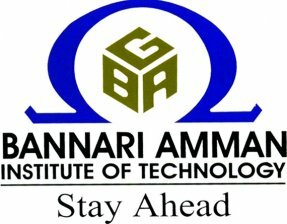 Bannari Amman Institute of Technology, Sathyamangalam is affiliated to Anna University of Technology, Coimbatore. List of facilities available at Bannari Amman Institute of Technology, Sathyamangalam for students. This page was last modified on 1 April 2016 at 19:04.